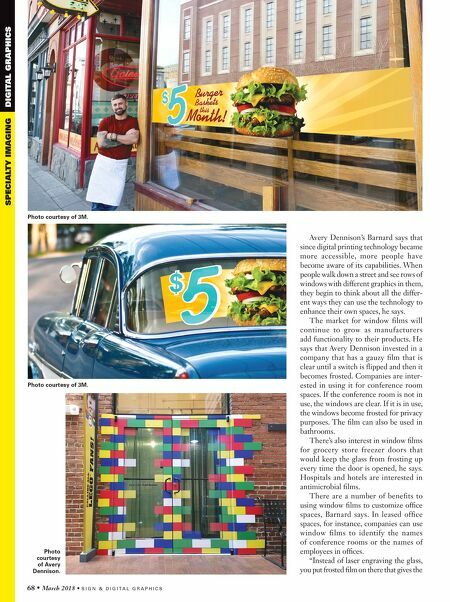 68 • March 2018 • S I G N & D I G I T A L G R A P H I C S SPECIALTY IMAGING DIGITAL GRAPHICS Avery Dennison's Barnard says that since digital printing technology became more accessible, more people have become aware of its capabilities. When people walk down a street and see rows of windows with different graphics in them, they begin to think about all the differ- ent ways they can use the technology to enhance their own spaces, he says. 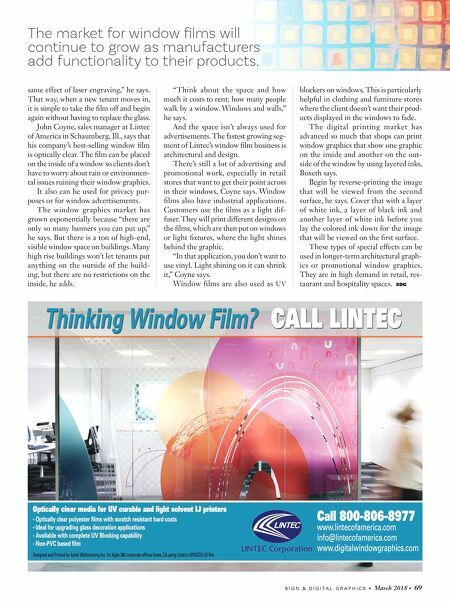 The market for window films will continue to grow as manufacturers add functionality to their products. He says that Avery Dennison invested in a company that has a gauzy film that is clear until a switch is flipped and then it becomes frosted. Companies are inter- ested in using it for conference room spaces. If the conference room is not in use, the windows are clear. If it is in use, the windows become frosted for privacy purposes. The film can also be used in bathrooms. There's also interest in window films for grocery store freezer doors that would keep the glass from frosting up every time the door is opened, he says. Hospitals and hotels are interested in antimicrobial films. There are a number of benefits to using window films to customize office spaces, Barnard says. In leased office spaces, for instance, companies can use window films to identify the names of conference rooms or the names of employees in offices. "Instead of laser engraving the glass, you put frosted film on there that gives the Photo courtesy of 3M. Photo courtesy of 3M. Photo courtesy of Avery Dennison.